나트랑, 베트남의 차우 로안 호텔 나트랑 | 호스텔월드에서 예약하세요. If cancelled or modified up to 7 days before the date of arrival, 100 percent of the first night will be charged. One child from 5 to 10 years is charged USD 6 per person per night when using existing beds. One further older child or adult is charged USD 12 per person per night in an extra bed. 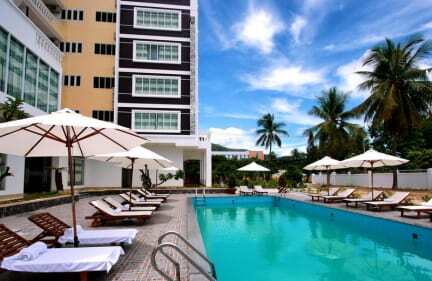 Chau Loan 3 stars Hotel features its own OUTDOOR POOL and provides accommodations with large windows offering city or sea views and free Wi-Fi. The hotel is located across a public beach in Nha Trang” . Chau Loan hotel provides a peaceful, pure space and close to the scenic and the entertainment center such as Chong rock, Cham tower, hot mudbath center. 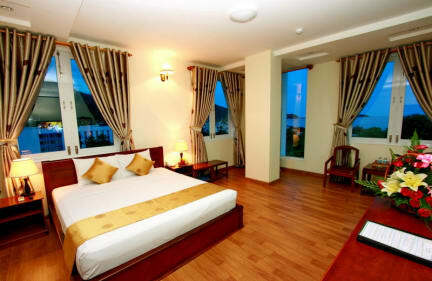 The center of Nha Trang city is 3.2 km away and Nha Trang Train Station is 4 km from the hotel. Cam Ranh Airport is approximately 35 km away. The large windows offer views from each room, which are air-conditioned and have a cable TV, minibar and sitting area. The private bathroom includes a bathtub, hot shower and free toiletries. A 24-hour front desk provides luggage storage and safes. Laundry and ironing services are available for a fee. The hotel has its own tour desk and guests can rent motorcycles, car and bicycles. Buffet breakfast is served daily from 6:00 am-9:30 am at the hotel’s restaurant, which specializes in Vietnamese and International cuisines. One additional older child or adult is charged USD 12 per person per night in an extra bed. Children over 12 years old will be counted as adult. 2).3 days in advance notice for free cancellation. 3)We accept both credit card and cash payment upon arrival.